Many people blame Christianity for wars and other calamities in human history. Little do they realize how much more common wars and barbarity were in the pagan world, before Christianity came along. Evil wasn’t eliminated under Christianity – there always are going to be villians, even among those who call themselves Christians. But Christianity and more specifically the Catholic Church (which for the most part was the only kind of Christianity for about first first thousand years after Christ) certainly did much to mitigate the barbarity of the world – and introduce the large-scale practice of caring for the poor and sick. Concern for human welfare is readily apparent in the teachings of Jesus Christ in the Gospels, and in the Acts of the Apostles when the St. Paul appointed the seven deacons to care for widows and orphans. W.E.H. 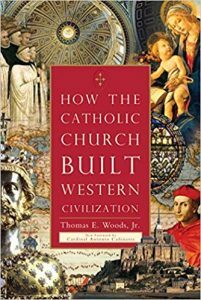 Lecky, a 19th century historian highly critical of the Catholic Church, admitted that the Church’s commitment to the poor constituted something new in the Western world, according to Tomas E. Woods’ book, How the Catholic Church Built Western Civilization. Before Christianity during the time of the Roman Empire, the poor all too often were treated with contempt, and the very idea of helping the destitute without any thought to reciprocity or personal gain was something foreign to most people – although to be sure, care of widows and orphans was an important part of Jewish life. In the early 4th century, famine and disease struck the Roman army of Constantine. Tacomius, a pagan soldier in that army, watched in amazement as certain people brought food and other provisions to the starving. Curious, he found out that these people were Christians. What kind of religion, he wondered, could inspire such acts of generosity and humanity? He was so moved that he became a Christian himself. azed that Catholic women would sacrifice their position in society to work in hospitals for the relief of the sick. 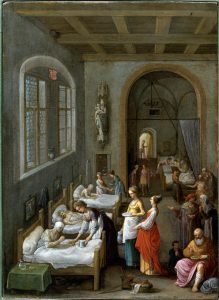 Charitable work went hand in hand with the development of hospitals, which the Catholic Church also appears to have pioneered. According to Woods, Christian facilities originally provided hospitality to strangers, but eventually cared for widows and orphans and the poor in general. Those evolved into institutions staffed by physicians. By the fourth century the Church began to open hospitals on a large scale, to the extent that nearly every major city in Europe eventually had one. Certain saints were instrumental in this endeavor. In the 300s St. Fabiola established the first large public hospital in Rome. In Caesarea (in modern-day Israel), St. Basil the Great established a hospital. Known as the apostle of almsgiving, he was particularly known for caring for lepers. Monasteries not only served as hospitals, but also ran schools, aided the poor, reared orphans, and provided models for agriculture, industry, and forestry. For centuries they were the centers of religious, charitable and cultural activities, writes Woods. In future posts we will explore other ways in which the Catholic Church established venerable human institutions. Stay tuned.